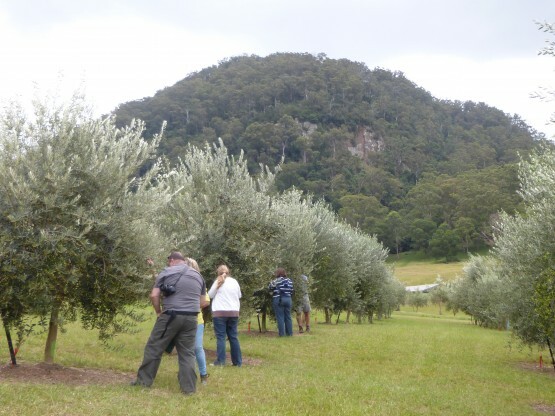 We’d like to thank grower Brenda Sambrook for hosting us on her property, one of the olive farmers that make up Kangaroo Valley Olives, and also her farm manager Dean. The harvesters arrived to enjoy morning tea, a briefing on the day ahead and then we hit the groves, where we took instruction from both Dean and Brenda on what and how to pick. We focused on the leccino trees, an olive usually pressed and made for oils, but that KVO will be experimenting with for table olives. Back in the processing room we weighed each person’s olive bag, with harvester Paul awarded the top prize, picking 4.11 kilos in the hour we spent in the groves. All up the group picked an impressive 44 kilos – apparently a good haul, with high quality fruit selected! In the processing room we learnt about the process for taking the table olives from the tree to the table, and also about pressing olives for oil. This was followed by a tasting of the extensive range of KVO products and then we sat down to a delicious lunch of slow roasted lamb shoulder, potatoes, carrots, salads and breads. To top it all off we finished with cake; the hit being my mum Rita’s Beetroot Chocolate cake! We hope to do this again next year. We can’t wait! Cam came and picked up 20 of us for a day of food, wine and beer tasting. Communicating with him was very easy and once we decided what to do for the day prior to my husband’s birthday dinner – Cam suggested an itinerary which had something for everyone, chocolate, gelato, wine & craft beer. Our bus was full of goodies purchased along with way. Everyone enjoyed their day out and as the organizer I was confident that we would be well looked after. Thanks Cam for helping making my husband’s birthday weekend memorable.